We are a leading creative communications agency established in 2000 supporting the growth of the region's dynamic markets from our headquarters in Dubai, United Arab Emirates.  We oversee offices and networks across the Arabian Gulf, Levant and North Africa. Orient Planet has played a strategic role in communicating several major developments in the region, particularly in GCC countries. We have worked with key government entities and multinational corporations and supported growing businesses while expanding our regional presence. The success of our campaigns has earned us numerous awards and recognitions from prestigious regional and international organizations. We have paved the way for a distinct brand of PR practice, capitalizing on the diversity of our teams who are experienced in various industries and armed with local knowledge of regional communications practices. Our range of services are offered in Arabic, English and French, handled by professional translators and editors to accurately reflect the essence of the content and key messages that companies and organizations aim to communicate to their audiences.